I have a soft spot for independent role-playing games; particularly ones that once published are very thin in size. I always assume that a thin game book means that the game itself is simple to use. I romantically imagine that this game company, which no one has ever heard of, has managed to take on “big RPG” and build a better system. A simple system. A system that I can understand without needing my other gamer friends to explain it to me, or worse make my character for me. In defense of many well known RPG game systems that are in fact, quite simple; I am, in fact, quite slow on the uptake. Yes, I just said it’s not you; it’s me, to several role-playing game systems, satisfied? Despite never having any intention of running one of these independently released games, and that years ago I dropped out of my longtime gaming group to work on The Magical Buffet and pursue other interests, I just keep buying these damn games. They almost universally disappoint, and because they’re not cranking thousands of these out from some print company that they have some sort of deal with (Damn you “Big RPG”!) the price points on these experimental purchases are not great. Twenty to thirty dollars is a lot to pay for a book whose contents you will never utilize. (Of course $20 to $30 can be dirt cheap compared to some big name game books.) It seems many of them are straining so hard to be different that they create a frightening Frankenstein monster, generally using the worst ideas from other systems to craft theirs. I guess my advice to any folks out there attempting to design their own role-playing system is that you can never have your game play tested enough. And you know those obnoxious kill joy gamers you put up with for any number of reasons? Definitely have them take a crack at it. Trust me. With all this in mind, you’ll understand why when I found myself in Rochester, NY for an appointment with a new specialist; my husband and I felt obliged to check out a local game store, Millennium Games. As luck would have it, they were prepping to do an inventory so they had three long tables filled with all kinds of oddities at greatly reduced prices. You guessed it, tons of long forgotten role-playing games and their supplements for only $1 a piece. That’s right, one slim dollar. 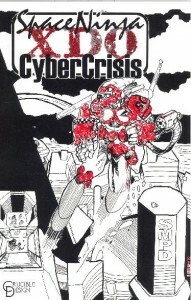 That’s where I saw it; a pocket sized book of only 52 pages in length covered in dust; Space Ninja Cyber Crisis XDO. “A game set in a world filled with beautiful cyborgs, cute robots, superfast cyberbikes, powered exoskeletons, giant mechanoids, speed lines, comical pets, strange aliens, maniacal villains and demons with amazing groinal powers…..” And so I bought it, for one dollar. Turns out this simple role-playing send up of futuristic Anime/Manga was put together in Northern Ireland! The original retail for the book at Millennium Games was $13.99. The art for the book, which is quite good for a random RPG, was done by Paul J. Holden in Belfast. The concept and design came from Matt Johnson, presumably from Northern Ireland, home to Crucible Design. I have in my possession a crazy little independent game that traveled quite a distance to end up on a clearance table in Rochester, NY. As I mulled over the setting I realized that the awesome high tech future they were discussing was 2019, a mere 9 years away. Obviously with this being a game inspired by Anime/Manga, they created a hyper extreme future, but I couldn’t help but wonder when this game was published. I suddenly found myself wondering, is the future what Matt Johnson thought it would be? What were his hopes as he decided what an amped up Anime/Manga future would look like? Does he find himself asking, where are the flying cars? Join me on Thursday for part two of this story as I examine exactly where our future is in relationship to SNCC XDO.